Something a little bit different for fans of autoflowering varieties. Royal Kush Automatic is a cross between autoflowering Ruderalis strains with a quick-flowering Kush. This Kush influence, while only minor, shows in the plant’s height. Still a compact plant but taller than many autoflowering varieties, it will grow to a height of 60 to 90 cm. Royal Kush Automatic will be ready for harvest 8 to 9 weeks after planting the seeds. The plants can smell quite strong during flowering, giving off a rich, spicy, almost fruity aroma. This smell only improves after the plant is dried and cured. The buds are not as dense as some other autoflowering varieties that are more Indica dominant. However, the yields are of a good quality and each plant can produce up to 170 g if grown well. 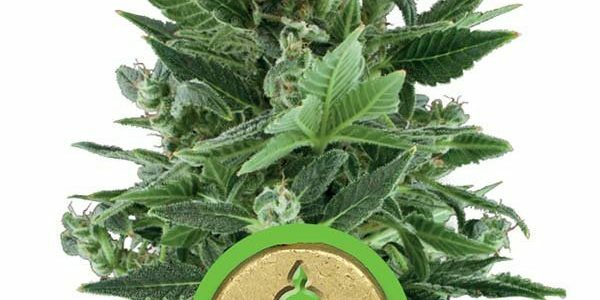 Like all of our strains, Royal Kush Automatic seeds are feminized, which makes growing it even easier. It is a great overall strain. The effect is physically uplifting with a clear, happy high. This entry was posted in Royal Queen Seeds Autoflowering. Bookmark the permalink.